A rare pink diamond dubbed “The Princie Diamond,” because it once belonged to Indian royalty, has sold for $39.3 million at a Christie's auction in New York City. The price for the 34.65-carat rock is the second highest ever for a jewel sold at auction and it was bought by an anonymous telephone bidder. The gem was discovered 300 years ago in the Golconda mines in South Central India. In 1960, it was acquired at auction by the London branch of the exclusive jeweller Van Cleef & Arpels, which paid the equivalent to $1.3 million today for it, Christie's said, indicating a hefty profit after Tuesday's sale. The diamond name was bestowed at a party at the firm's Paris store. It was called Princie in honour of the 14-year-old prince of Baroda, who attended the party with his mother, Maharani Sita Devi. 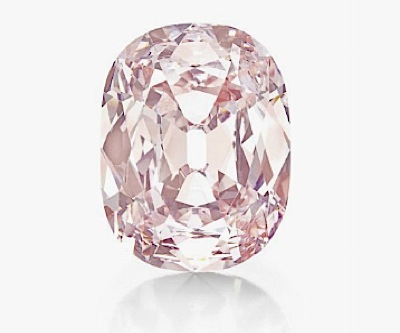 Until now, the most paid at Christie's for a rock was $24.3 million in 2008, for the 31-carat Wittelsbach diamond.